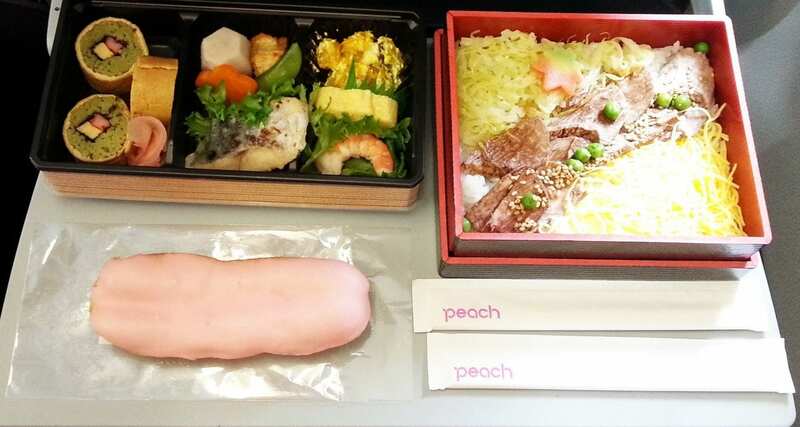 Review on Peach Airlines meals! I recently tested out the food on Peach Aviation which has its main base at Osaka Kansai Airport in Japan. 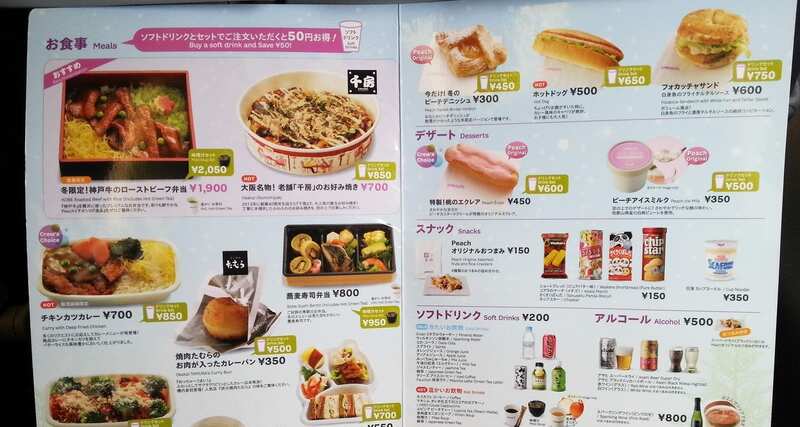 The airline doesn’t serve free inflight meals but instead offers a great range of local Japanese options that you can buy. On a flight with only about an hours flying time, I bought a number of items to test out. I ended up sharing quite a lot of it with my seat neighbours who were very happy. First off you notice what a fantastic inflight menu offering is available. Yes, Japanese airports have great food options, but if you can save yourself for the flight you will enjoy the experience. Look at the food options available on this menu, even on short flights they will try and accommodate your requests of hot meal options. I tried the Kobe Beef bento box, the sushi bento box, the Japanese pancake and had room for dessert. The Kobe Beef Bento box is the most expensive item on the menu it will set you back around 1800YEN, (Around US$18.00) however I believe it was worth every penny. The Kobe beef is served with rice, salad and noodles and comes in a cute little box. The sushi bento box is chock full of Japanese delights and it’s made fresh daily in Osaka. It will set you back around USD$7.50 for the box, and again it’s excellent value for money. It comes with a wide range of sushi and local delicacy options. Tip! The Japanese pancake takes around 15 mins for the cabin crew to prepare so order early if you can. The pancake itself is made by the famed restaurant chain Chibo. It will be served wrapped in foil and you will need to unwrap it and add your condiments. You can choose from five different condiments Okonomi Sauce (special Japanese barbecue sauce for “Okonomi Yaki”), Katsuo Bushi (bonito fish flakes), Aonori (seaweed powder) and Mayonnaise. I always find it fun to play with your food inflight, and you can add as many/fewer condiments to this pancake as you wish. For dessert, I order the Peach eclair which even has pink cream inside and pink frosting on top. During Summer the airline offers an inflight sherbert and I’ve heard great feedback about this item. Definitely worth buying something on board. No matter which airline you fly in Japan I think you will be pleasantly surprised at the menu offerings, quality of product and taste. Peach is a great little airline that offers some of the nicest food for purchase items I have seen in a very long time. You can check out the inflight menu here.